Crystals aren’t just a way to make your bedroom Instagram-level dreamy, or for Superman to watch holograms of his late Kryptonian parents, some believe they’re also capable of transforming the energy and mood of your entire space. “Crystals are special by default because they’re beautifully and naturally made from the Earth—they’re nature’s little pieces of art,” he explains. “So when we bring them into our homes, we bring the Earth in as well and create a more nurturing environment.” You could technically call soil earth too, but a crystal looks much prettier and is less likely to leave a mess on your table than a lump of mud. Luke says that “different crystals emit different feelings, so you want to make sure you’re channeling the right ones for each room.” We could all use a little more of that—but where to start? Simon suggests going for what you’re visually attracted to, above all else. “Don’t get too caught up in what you’re ‘supposed’ to feel. Just check in and notice what you’re drawn to in a store, even if you didn’t know what the crystal was ‘meant’ to do before you saw it, that strong instinctual attraction is very telling.” And don’t worry, there are no crystals with negative traits, unless you happen upon a uranium crystal, in which case call the government, seek medical help and don’t let Kim Jong Un get his hands on it. Although choosing a crystal is the easy part, Simon explains that deciding where to place it once you’ve brought it home requires a little more research. “Crystals have natural patterns in them that vibrate on a subtle level, sending out positive energy —that’s why we feel so great when we visit nature. But different crystals emit different feelings, so you want to make sure you’re channeling the right ones for each room.” In other words, you probably don’t want to place an energizing stone right next to your bed…or one that’s too calming at your workstation, unless you inexplicably work better when you’re almost asleep. This is a place where we do a lot of thinking, so it’s nice to have some support in that department. Even if you don’t necessarily feel the crystal’s energy, it has a subtle, underlying magic that’s always working. So every time you look at the crystal, you’ll remember that you bought it to clear your mind and focus (do remember to still look at your screen though, staring at a crystal alone will not help you finish before a deadline). I recommend an amethyst cluster—a bunch of different-sized and -shaped crystals—for your desk. Amethyst is very relaxing, clarifying, spiritual, and great for opening your mind. Since a cluster has so many different points, it’s also great for an office with other people—it will send positive energy to everyone in the room, and even that miserable office grump everyone’s scared of may crack a smile. Rose quartz is used for self-love (get your mind out of the gutter) and gives off a gentle, nourishing energy. Color is very important to consider when choosing crystals, and rose quartz is pink—which is generally all about love, joy, and selflessness. A very comforting way to feature rose quartz in your room is to put four crystals on the floor at each bed post, which will literally surround you with love. Even just one by your bed will help generate a soothing and calming feeling. Who needs a partner when you have crystals giving you loving!? The kitchen is considered generally a warm and friendly place, (unless you leave weeks of dirty dishes to pile up —maybe don’t do that) so the crystal I recommend is orange or yellow calcite. Not only are those colors alone very nourishing and energizing, but calcite itself is a wonderfully cleansing crystal that emits a very soft energy. It’s often used for depression, so you may feel a bigger lift than the sponge cake your baking. 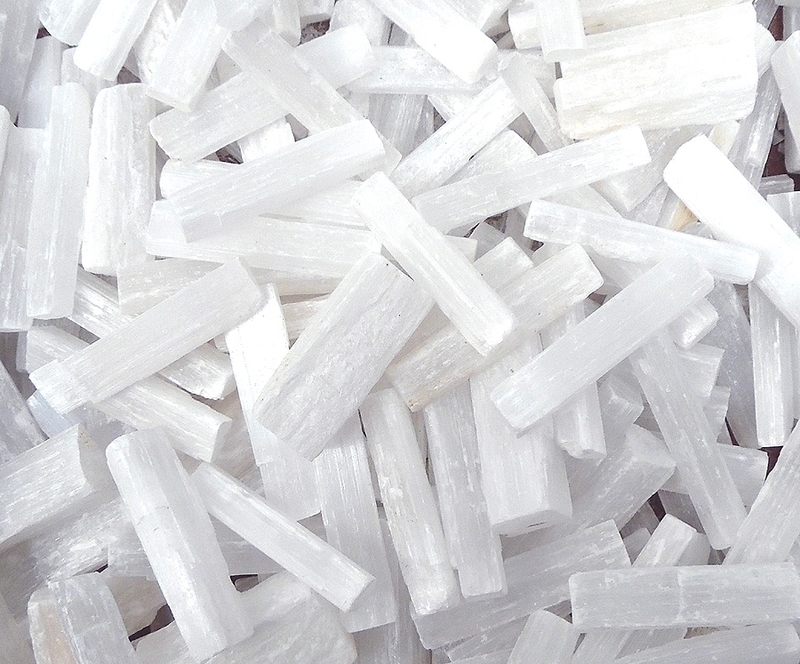 Selenite has a very sweet, calm, angelic vibe; you can get huge chunks of it that are beautiful. It is very delicate though and can’t be dropped, so perhaps remove it if you’re planning a wild party, where you won’t be needing so many angelic vibes until the hangover the next day (when you’ll definitely want it). Black tourmaline is really a great crystal to have anywhere in your house, but it can be especially powerful by a front door, window, or entryway. It’s very protecting and acts as a negativity transmuter, so you can essentially “scrub off” anything from the outside that you don’t want to bring in (not literally though so don’t attempt to use it as a doormat, that won’t end well). It can also be great to have by a computer for the same reason. I think quartz would be great for near a bathtub; it’s clear and multi-faceted, but very directive like water. It would sort of mirror the clarifying and cleansing effect of the water, but for the mind - because you can’t get that from a power shower alone.